The Multidimensional Poverty Index (MPI) 2017-18 uses the same parameters (dimensions, indicators, cutoffs, and weights) and the same functional form (Alkire and Foster Adjusted Headcount Ratio M0) as in previous years. This brief methodological note presents the 2017-18 MPI updates and releases tables with the full results in these categories: national MPI, destitution and vulnerability, disaggregation for rural, urban, subnational regions, and complete estimations, as well as complementary data, dimensional breakdowns, and confidence intervals. Destitution data are available for all 104 countries. This brief methodological note first explains the main updates in the 2017-18 MPI, following the guidelines for updates presented in the 2014 Methodological Note (Alkire, Conconi and Seth 2014b). It then summarises the MPI methodology that has been presented in detail in other documents (Alkire and Santos 2010; Alkire, Roche, Santos and Seth 2011). This note then briefly describes the methodological assumptions for the estimation of each updated country dataset. The results of these estimations are presented in Tables 1-5 and 7, 104 country briefings and the interactive databank, all available on OPHI’s website (www.ophi.org.uk). categories: national MPI, destitution and vulnerability results, rural, urban, subnational regions, changes over time, and complete estimations, as well as complementary data, dimensional breakdowns, and confidence intervals. Destitution data are now available for all 103 countries. It adds a new section on disaggregation by children. The results of these estimations are presented in eight main tables (Table 8 focusing on age disaggregation), 103 country briefings and the interactive databank, all available on OPHI’s website (www.ophi.org.uk). The Winter Multidimensional Poverty Index (MPI) 2016 updates (released December 2016) uses the same parameters (dimensions, indicators, cutoffs and weights) and the same functional form (Alkire and Foster Adjusted Headcount Ratio M0) as in previous years. 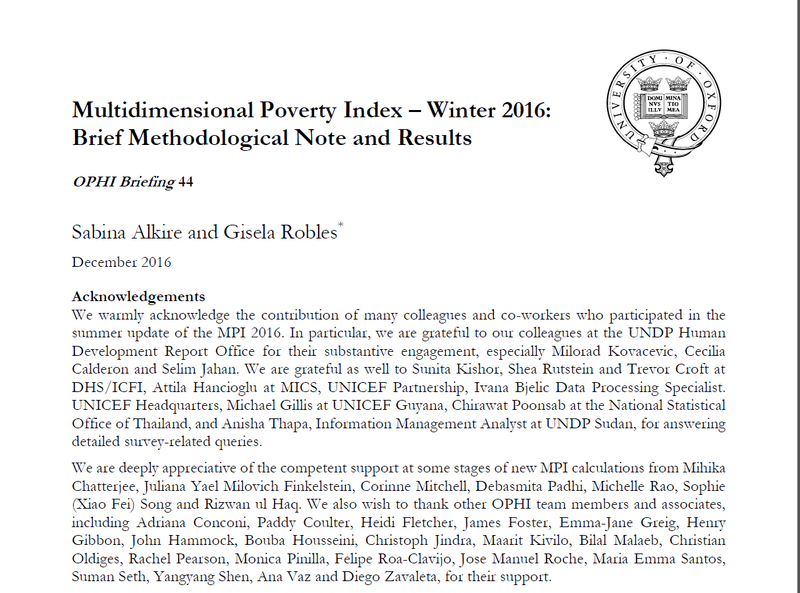 This brief methodological note presents the Winter 2016 MPI updates, and releases the tables with the full results: national MPI, destitution and vulnerability results, rural, urban, subnational region, changes over time, and complete estimations, as well as complementary data, dimensional breakdowns, and confidence intervals. The Summer Multidimensional Poverty Index (MPI) 2016 updates (released June 2016, henceforth MPI 2016) use the same parameters (dimensions, indicators, cutoffs and weights) and the same functional form (Alkire and Foster Adjusted Headcount Ratio M0) as in previous years. The main MPI updates are released in summer; Winter MPI Updates provide the opportunity to share new estimations for 15 databases that have been processed, and 16 countries for changes over time. 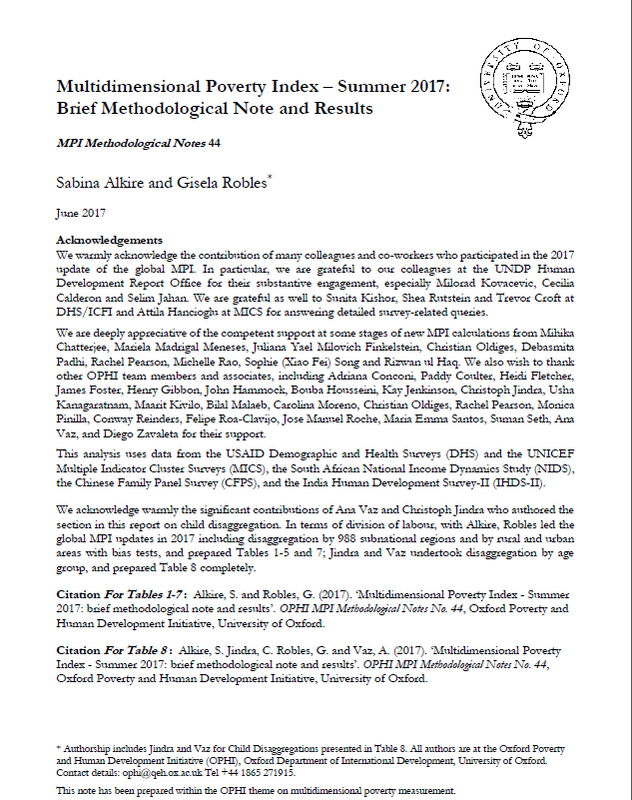 This brief methodological note presents the Summer 2016 MPI updates, and releases the tables with the full results: national MPI, destitution and vulnerability results, rural, urban, subnational region, changes over time, and complete estimations, as well as complementary data, dimensional breakdowns, and confidence intervals. This document synthesises all foregoing studies, to provide under one cover a comprehensive guide to the methodology of estimating and reporting the global MPI in 2015. Recall that the methodology for the first global MPI was first issued in a working paper co-published by OPHI and HDRO, by Alkire and Santos (2010). The underlying methodology, dimensions, indicators, and cutoffs have remained unchanged since 2010. Yet adjustments have been made by HDRO’s and OPHI’s mutual agreement. Each year a methodological document has accompanied the global MPI launch, and has transparently documented any agreed methodological adjustments included in that year’s estimations. Previously published estimations were not changed. This document summarizes how the Global MPI 2015 is computed, drawing on each previous Methodological document sequentially. However before moving to the specifications we provide a brief intuitive introduction to the MPI and its linked partial and subindices, as well as clarifying how a Global MPI differs from official national poverty statistics. as complementary data, dimensional breakdowns, and confidence intervals. The Multidimensional Poverty Index (MPI) (released January 2015, henceforth Winter 2014/2015 MPI) uses the same parameters (dimensions, indicators, cutoffs and weights) and the same functional form (Alkire and Foster Adjusted Headcount Ratio M0) as in previous years. The main innovations in 2014 consisted in: updating the estimations for a larger series of countries than any previous year, providing further analysis over time, as well as a new measure of destitution, and new measures of inequality among the poor and across subnational regions. This brief methodological note presents the Winter 2014/2015 MPI updates, and the tables with the full results. It first explains the main updates in the 2014/2015 MPI, following the guidelines for updates presented in the 2014 Methodological Note (Alkire, Conconi and Seth 2014b). It summarises the MPI methodology that has been presented in detail in previous methodological notes (Alkire and Santos 2010; Alkire, Roche, Santos and Seth 2011; Alkire, Conconi and Roche 2013; Alkire, Conconi and Seth 2014b). Then it briefly describes the measures of destitution and the index of inequality among the poor. The methodologies presented in this note were used to generate the tables on the MPI and the 110 country briefings and interactive maps available on OPHI’s website. The results are available to download as Excel files. From January 2015, the global MPI estimations will be updated twice per year. This methodological note appends the considerations for the new and updated country estimations to a shortened version of the June 2014 methodological note. The Winter 2014/15 MPI team was led by Gisela Robles Aguilar. Download the 2014 methodological note. 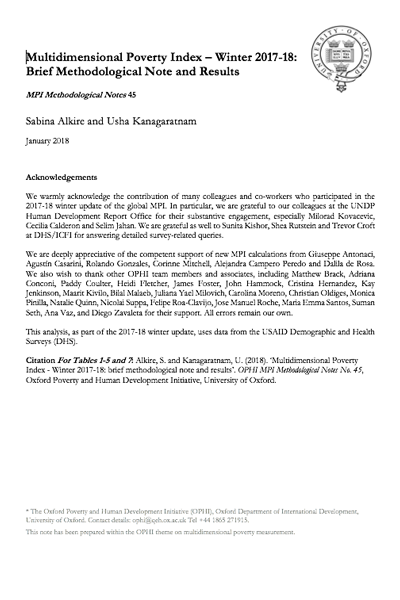 This note introduces the methodology used to construct the Multidimensional Poverty Index (MPI) 2013 and shares the main updates that have taken place. consists in updating the estimations for a series of countries and providing further possibilities for analysis over time. This brief methodological note outlines specific changes and clarifications concerning the MPI 2013 estimations. It first explains the main updates in the MPI 2013 as well as the policies that will govern the MPI updates from 2013. It summarizes the MPI methodology that has been presented in detail in other documents (Alkire and Santos 2010; Alkire, Roche, Santos and Seth 2011). Then it explains the DHS nutritional subsamples and treatment for analysis over time. Finally, brief guidelines on how to undertake accurate analysis of changes over time are presented. The methodologies used to generate the tables on the MPI and the 104 country briefings and interactive maps available on OPHI’s website, as well as the results published in the 2013 Human Development Report, are presented in this note. The tables are available for download as Excel files here. Download the 2013 methodological note. This note i) introduces the methodology used to construct the Multidimensional Poverty Index (MPI) 2011, ii) shares the main updates that have taken place since 2011, and iii) presents initial robustness results. The 2011 MPI uses the same dimensions, indicators, cutoffs, and weights in as in 2010, and the functional form has not changed. The construction of the MPI is explained in a non-technical fashion in Part 1 of this note. Part 2 outlines the updates to the MPI and the innovative analyses conducted this year. The updates are as follows: this year the MPI has been constructed for five additional countries. A new MPI has been released drawing on updated data for 20 countries. Innovative analyses include decomposition by sub-national region, time series comparisons, the calculation of standard errors, and the construction of MPI-related environmental indicators. The methodologies used to generate the tables on the MPI and the country briefs and maps on OPHI’s website, as well as the results published in the 2011 Human Development Report, are presented in this note. 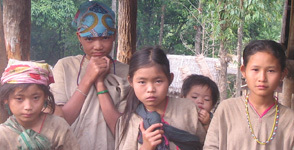 Download the 2011 methodological note. This paper presents a new Multidimensional Poverty Index (MPI) for 104 developing countries. It is the first time multidimensional poverty is estimated using micro datasets (household surveys) for such a large number of countries which cover about 78 percent of the world ́s population. The MPI has the mathematical structure of one of the Alkire and Foster poverty multidimensional measures and it is composed of ten indicators corresponding to same three dimensions as the Human Development Index: Education, Health and Standard of Living. The MPI captures a set of direct deprivations that batter a person at the same time. This tool could be used to target the poorest, track the Millennium Development Goals, and design policies that directly address the interlocking deprivations poor people experience. This paper presents the methodology and components in the MPI, describes main results, and shares basic robustness tests.